The Arsenal, U.S. Armory, Springfield, Mass. This early 20th century photo captures the main arsenal building of the Springfield Armory. 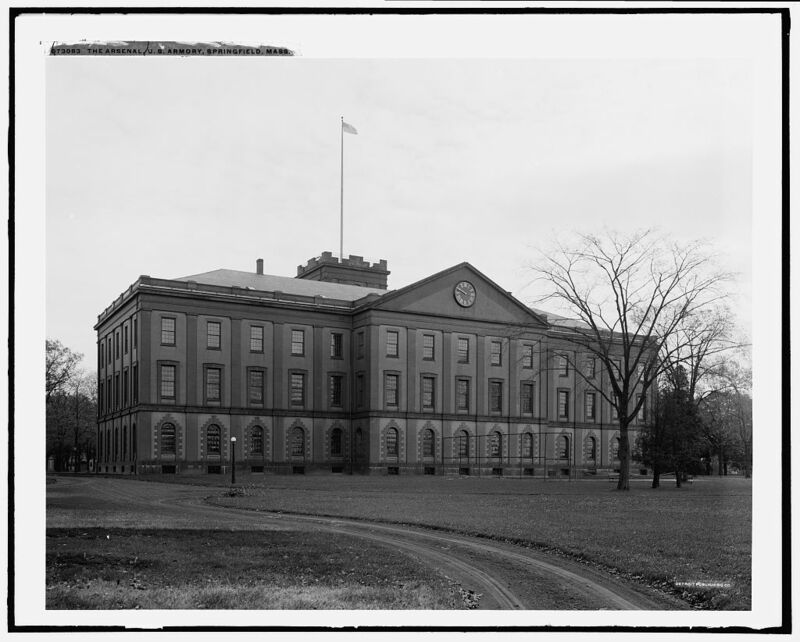 "The Armory at Springfield, Massachusetts, began as a Revolutionary War arsenal (a storage and supply depot, as opposed to an armory, where weapons are made) responsible primarily for repairing small arms, making gun carriages and musket cartridges, and storing powder and various war materials. The arsenal was the scene of a battle during Daniel Shay's rebellion in 1786." -from the ForgeOfInnovation.org website text. Notes: - Detroit Publishing Co. no. 073083. The Water shops, U.S. Armory, Springfield, Mass. When the armory was established in 1794, the Mill River was where it established a series of early workshops, at three different falls. 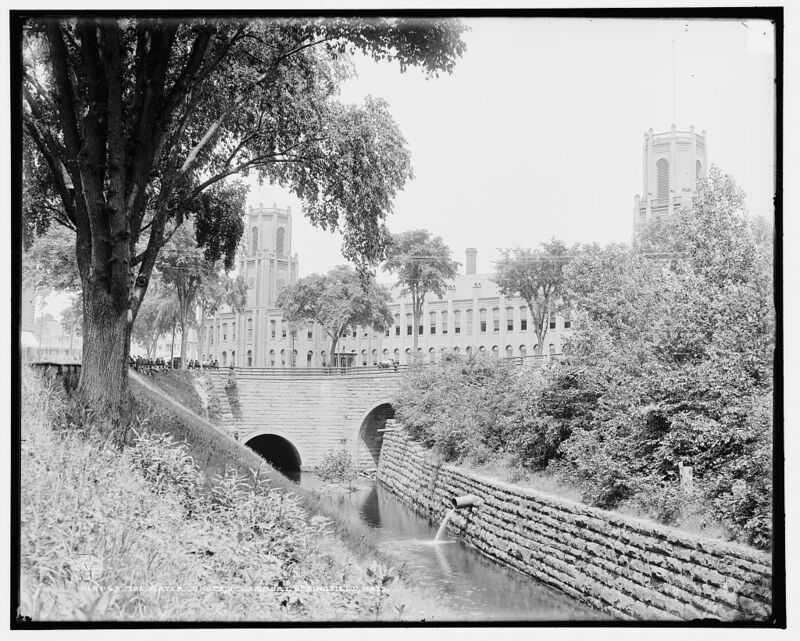 In the 1850s, these facilities were reorganized into a single site, with the first of the present buildings built in 1857. Over the next four years, additional buildings augmented the capabilities of the site, giving it sufficient capacity to meet the armory's heavy manufacturing needs. The dam and canal were built to raise the level of Watershops Pond, and new turbines were installed to provide 300 horsepower for the facilities. Notes: - Corresponding glass transparency (with same series code) available on videodisc frame 1A-30249. - "2191 A" on negative. - Detroit Publishing Co. no. 018063. Contributor Names: United States. National Park Service. - Includes location map, text, and ill. (some col.). 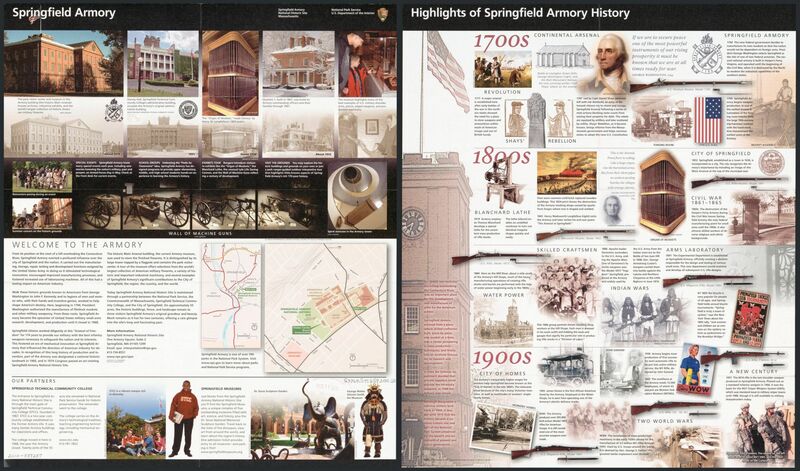 - Text on history of Springfield Armory and ill. (some col.) on verso. Notes: - "*GPO: 2007--320-358/00650. Reprint 2007." 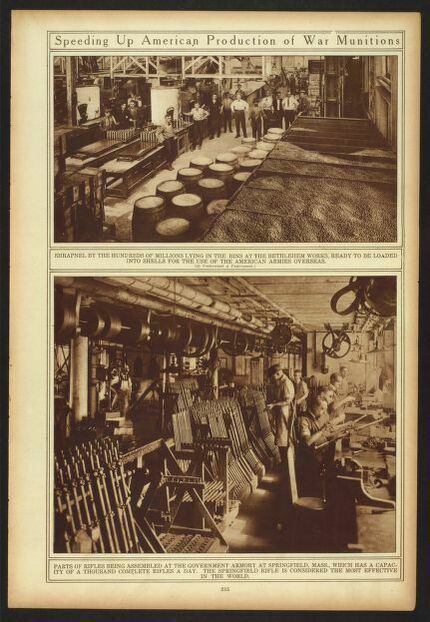 - Includes location map, index to buildings, text, and ill.
Caption (lower photo): Parts of rifles being assembled at the government armory at Springfield, Mass., which has a capacity of a thousand complete rifles a day. The Springfield rifle is considered the most effective in the world. Summary: Contains 1,398 rotogravure images with brief descriptive captions, broad organizational headings, and a table of contents; 32 maps that describe military engagements throughout the war; and a 3-page appendix that provides a chronology, statistics, treaty excerpts, and highlights of wartime events. Created / Published: New York : New York Times, Co., 1919. Notes: - At head of title: 1914-1919. - Also available in digital form on the Library of Congress Web site; forms the bulk of the American Memory collection "Newspaper pictorials." 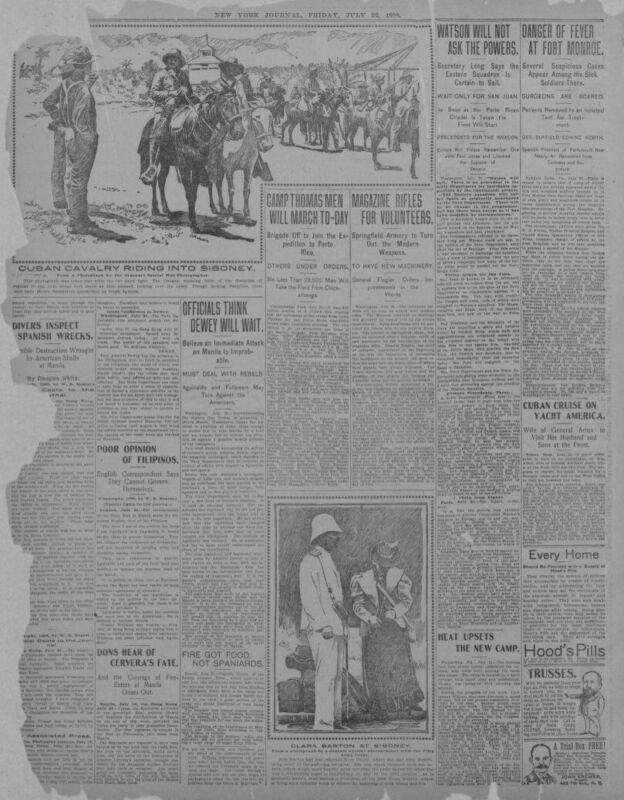 The New York journal and Advertiser (New York [N.Y.]), July 22, 1898 had many headlines related to the Spanish-American war developments in Cuba and the Philippines. Headline: Magazine Rifles for Volunteers - Springfield Armory to Turn Out the Modern Weapons. TO HAVE NEW MACHINERY. General Flagler Orders Improvements in the Works. Article reports on production, funding appropriations, and shipment quantities of rifles sent the previous evening. - No. 5,251 (Apr. 2, 1897)-no. 6,933 (Nov. 10, 1901). The Lyman and Merrie Wood Museum of Springfield History features the products of the Springfield Armory's legacy of precision manufacturing. 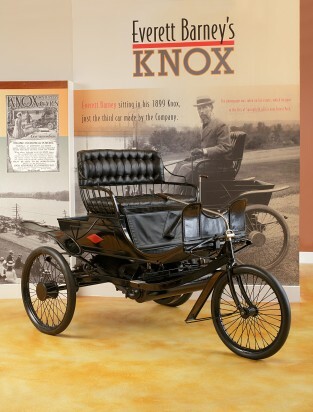 In addition to the Firearms Collection with the largest collection of Smith & Wesson guns in the world, it has a definitive collection of Indian motorcycles, and a collection of early automobiles which includes an 1899 Knox, a 1901 Crestmobile, a 1925 Rolls-Royce roadster, and a 1928 Rolls-Royce roadster.